I wonder who´s winning. Is it Suleman, who urges people not to let their companion animals be like her? Is it reality tv, for which Suleman is now bound? Is it the people who compare their pets to Suleman? Is it the animals who might therefore end up sterilized? Is it society who benefits from people spaying their animals so they don´t end up like Suleman? To my eyes, this comparison manages to simultaneously demean both Suleman and the nonhuman animals with whom she compares herself. She holds herself up as a type of undisciplined, thoughtless breeder to which spayed animals compare favorably. Yet she also says that humans are different. Different how? Different in that it´s ok for humans to reproduce irresponsibly? Different in that human reproduction should not be characterized as irresponsible? Different in that discussions of human reproduction (and Suleman in particular) come laden with all kinds of unfortunate gender, class and race politics? And finally, different in that it is morally sound (and/or even right) to remove the reproductive organs of animals whereas doing the same to a human would violate all kinds of norms? I have pondered before the ethical basis for sterilizing nonhumans even as I recognize the practical necessities involved. I continue to worry, however, that practical necessity is a fragile reed on which to base a policy with serious moral implications. Therefore, when I see the sterilization discussion being carelessly broadened in a way that encourages people to a) ignore the ethics of such actions at the nonhuman level; and b) treat human reproduction with the same broad strokes, it makes me think less about our responsibilities to companion animals and more about eugenics. In short, Suleman and PETA´s arrangement seems less of a `win-win´ than an embodiment of the myriad ways that our society can´t seem to win for losing. Oh come on, lighten up. Sule has a good sense of humor((which one needs with 14 kids in the house!) It was just in the 1900’s when i4 children were not unusual and the only reason every one is so upset with her is that because of the fertility drugs she had 8 at one time! Not her fault but a poor judgement call on the part of her OB doctor. Rather than cast stones at the poor woman, who is a mother, and not neglecting or abandoning her little ones,I think as a society we should do everything possible to assist her to raise these children as healthy, knowledgable citizens of the USA. 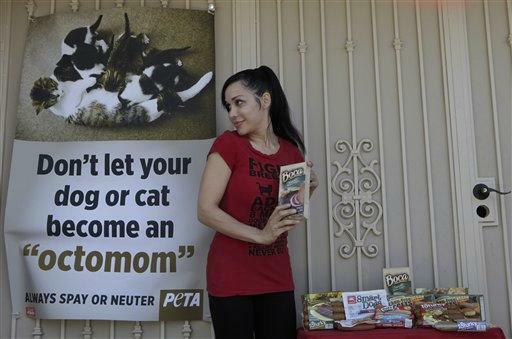 Good for PETA for helping her earn money to put food on the table! If a man had done this we would be applauding his good sense and telling him what a good provider he is. critical of her choices in regards to her own and her children’s lives. Also I think the American people as a whole are intelligent enough to understand PETA’S message that overpopulation is everyones problem. Honor Hannon, doesn’t your last sentence contradict your previous arguments that we shouldn’t judge Suleman? I’m with you, actually, about not judging her. I am also with you that overpopulation is everyone’s problem. But I recognize the obvious tension in those statements and feelings. And it is that tension, that unease, that PETA seems to uncritically mine here. And that is why I think this is a very smart and useful post. Anyway, I don’t know if that was clear, but I wanted to thank David Cassuto for this. I don’t think I would have seen the issues with this, but I agree that this is a symbolically fraught situation, one not easily shrugged off. Thanks Scu, I appreciate your insights. And thank you too, Honor, even though I don´t share your view. While I too feel there are times when we all (including and perhaps especially me) need to lighten up, this does not feel like one of those times. It would be dreadful if everyone were to have 14 children. Thins are dreadful enough, with the current population levels. But it would also be dreadful if people were denied the right to have 14 children if they wished to. The bottom line is, I think, that it works so long as it’s only rare people that wish to have 14 children. Fortunately, few sane people harbor that desire, so there’s no reason for people to attack Suleman as vigorously as she has been attacked. As far as the animals go…I’ve never grown used to the ease with which we neuter or spay them. And yes, with people, the same licence has often been taken. We don’t have to look to Germany, for that – a long time after WW2, it was still done in America. On the other hand – the alternative seems to be that millions of healthy cats and dogs in the USA are euthanized every year. An even more horrible outcome.